Only 2 Months until the 10th Annual Clearing the Air in Communities of Color Conference! We are celebrating the 10th anniversary of our signature conference this year on Thursday, May 16th. Every year MISRGO provides a space and opportunity via the CACC to discuss tobacco prevention and education best practices, learnings, case studies and more that can be implemented in our minority communities. Individuals and professionals commune to share practical skills and comprehensive information about the best tobacco prevention strategies and innovations and improve multidisciplinary interaction and collaboration among people in the field of tobacco prevention and education. A variety of anti-tobacco advocates share stories of their experience within the tobacco industry and how they too seek to change consumption behavior within minority communities. The conference will be held at the Pine Bluff Convention Center May 16, 2013 from 9 am – 2 pm. There will be two tracks of activities: youth and adults. This is our 10th year hosting this signature conference and will feature wonderful speakers and special guests! Be on the lookout for your invitation in the mail! Registration is free. Call 870-575-8923 today to register or click here to register online. We had a very successful 2nd quarter in our work to educate Arkansans about tobacco prevention and cessation, and we executed several successful events and initiatives that reached minority communities across the state. 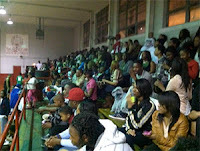 November 2012: Now in its third year, the 2nd quarter marked the completion of the MISRGO home game on-line ticket give-a-way promotion. MISRGO partnered with the University of Arkansas at Pine Bluff Golden Lions Football Team and KIPR for Home Game Ticket Give-A-Ways through misrgo.org. By visiting MISRGO’s website and filling out a short survey, an individual’s name was entered to win 2 tickets to a Golden Lions football game. The objective of the initiative was to connect UAPB’s Golden Lion supporters to MISRGO and our tobacco cessation and prevention message. From this promotion, we received approximately 50 responses to the online web banner ad and registration process! Overall, we secured nearly 150 questionnaires from game attendees that visited our booth and educated thousands of UAPB fans on the ills of tobacco consumption. October 2012: MISRGO participated in on-air interviews across the state to talk about the impact of cigar products on minority communities. Look below in this issue of MISRGO Mentions for more information about this story. 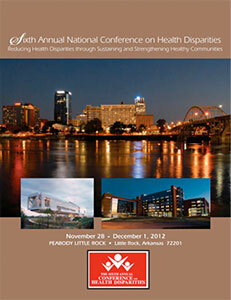 November 28 – December 1, 2012: This quarter, MISRGO served as a sponsor for the 6th National Conference on Health Disparities that took place November 28 – December 1 at the Peabody Hotel in Little Rock. The 2012 conference focused on policies and programs to reduce health disparities. Presenters emphasized the role of social determinants, personal responsibility and prevention initiatives that reduce disparities. MISRGO activated a booth to educate visitors about Arkansas’ minority tobacco prevention and cessation programs as well as the UAPB Master of Science in Addiction Studies program. Thousands of health advocates attended the conference, several of which stopped by the MISRGO booth for more information. 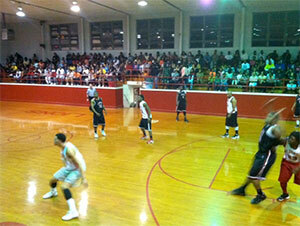 December 2012: We also began our annual sponsorship with the Jammers Charity Basketball Game this quarter. The purpose of the partnership with the Jammers is to utilize the basketball games as a means to disseminate anti-tobacco messaging and helpful quitting information to all attendees. For each game, MISRGO activates a booth for educational materials and on-site promotions, uses signs and collaterals, runs weekly radio spots to advertise the event, receives “mentions” throughout the duration of each Jammers Game and makes halftime announcements. While we have a presence at every game through signage and mentions, your MISRGO team had a significant physical presence in Altheimer, AR on December 1st where we spoke with the 250 attendees and Gurdon, AR on December 15th where we engaged over 300 people! As a component of our Hispanic Consumer Market outreach efforts, we kicked off the poster distribution campaign in the second quarter. 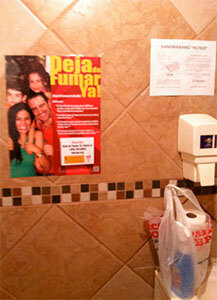 Posters serve as a key grassroots, communications tool for this audience. The posters include a family-centric message and encourage our target audience to quit smoking to improve themselves and the health of their loved ones. The posters also include an adhesive tear-off pad of information that noted the Quit Line as a call-to-action for those ready to quit smoking. One hundred and four (104) posters were distributed in Little Rock and North Little Rock at 47 locations. More than 150 posters have been distributed to date in Central Arkansas. Next quarter, we will distribute more of these posters in Northwest Arkansas! Addiction Studies Now On Facebook! UAPB Master of Science in Addiction Studies program now has a Facebook page! Please click here to take a look and like us! Feel free to send us suggestions of postings and information for this page. Make sure to refer your friends as well! Want to enroll to get your Master of Science in Addiction Studies from UAPB? Click here to visit our website or give us a call at 870-575-7715. Thank you to everyone who applied for monies for FY14! We will be announcing new sub-grantees this coming July. Call us at 870-575-3923 for more information or to apply for a mini-grant today! The NEW Minority Research Center on Tobacco and Addictions is Now Open! The University of Arkansas at Pine Bluff, MISRGO, and the Master of Science in Addiction Studies Program are all excited to announce the creation of the Minority Research Center on Tobacco and Addictions (MRC)! The center’s vision is to improve the health of Arkansans, particularly the minority population, through the radical reduction in the use of tobacco and other substances. MRC will act to provide assistance to the state and nation in tobacco and other substance abuse research, prevention, education, technical assistance and evaluation, especially in regard to minority populations (Blacks, Hispanics, Marshall Islanders, and Asians). Essentially, it will act as a clearing house for all research in Arkansas about tobacco use in minority communities. The MRC is located on campus at the University of Arkansas at Pine Bluff. To learn more about the Minority Research Center on Tobacco and Addictions call us at 870-575-3923. In recognition of Black History Month, your MISRGO team participated again in the 2nd Annual UAMS Mid South Black Expo on February 23rd at 10 am at the Metroplex in Little Rock. MISRGO provided educational information, on-site direct access to the Quit Line and helped attendees “Stamp Out Smoking.” A total of six fax-back referral forms were secured and three people that were ready to quit called the Arkansas Quit Line on site! We all well know that the tobacco industry spends millions of dollars in Arkansas marketing new addictive products. Cigar/cigarillo products are quickly becoming an issue for minority communities. Despite an FDA ban on flavored cigarettes, the tobacco industry continues to target young adults with products that taste like candy and smell like fruit. These products are becoming popular amongst African Americans and Latinos, especially our young people. The CDC reports that consumption of cigars and cigarillos has increased by more than 150% since 2007. MISRGO and our work with the community is the key component in mitigating cigar and cigarillo use in minority communities. We must continue to increase awareness of the issues, engage in the policy progress regarding cigar products and promote cessation efforts. Through social planning, awareness efforts, and community organization change can be implemented within our communities in Arkansas that have been devastated by tobacco use. This is exactly what you MISRGO team, our sub-grantees and community members are doing and it’s working! Thanks to our efforts we have seen a decline in tobacco (particularly smokeless tobacco) use in the minority community. 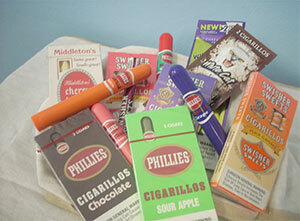 Do you or someone you know use tobacco products such as cigarettes, chewing tobacco or flavored cigars?